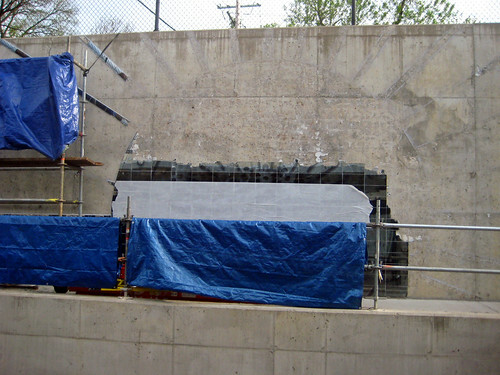 In early May of this year I was surprised to see a Metro work crew dismantling the art installation at the Forest Park - Debaliviere MetroLink station. 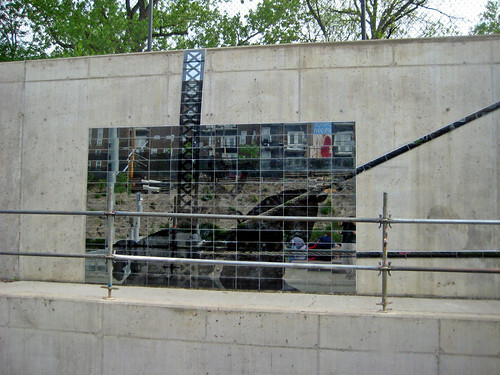 The work entitled: The View From Here by artist Ellen Driscoll was installed on the south concrete retaining wall of the station in 2006. The station, while open since 1993 for the first MetroLink line was reconstructed and expanded for the opening of the Cross County extension in August 2006. I emailed David Allen, Director of Metro's Arts In Transit, and he said that the installation was being removed at the artist's request due to problems with the installation. He said that they were discussions with the artist about a possible replacement piece. Indeed there were a few of the mirrored tiles that had fallen off from the concrete wall and presumably were destroyed upon impact below. Of the hundreds of tiles that made up the piece however these appeared to be isolated. 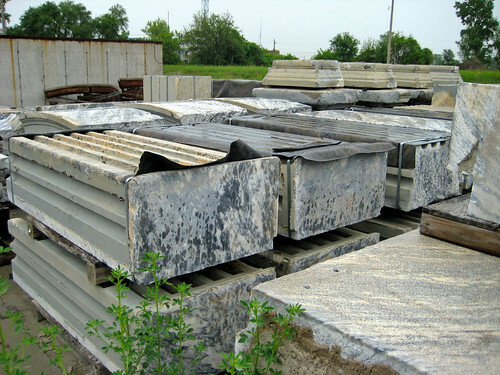 It seems like it would have been quite feasible to fabricate replacement pieces rather than to destroy the entire work. 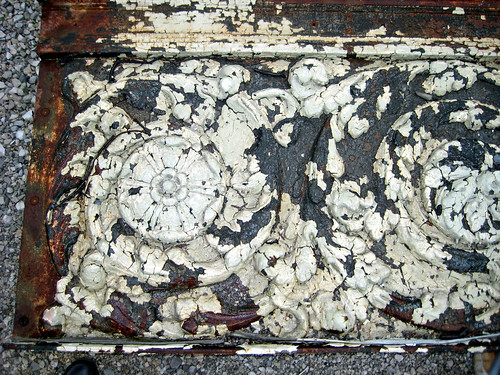 The process of removal of the work involved chiseling what had intended to be permanently installed tiles glued to the concrete. 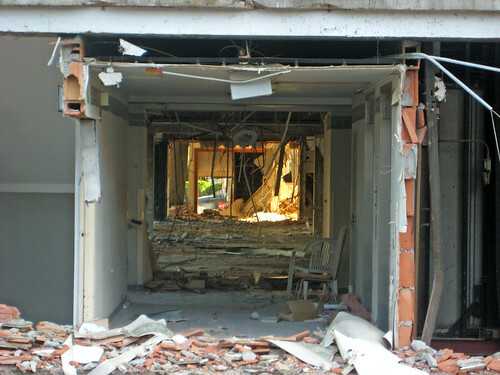 From the photos of the removal, it is clear that nothing of the work survived. I always liked this piece for its interesting geometric patterns and the varied reflections that one could see in the mirrored surfaces. Without The View, the big blank concrete retaining walls give the Forest Park station a drab and lifeless feel. Hopefully an equally interesting work of art will be installed in its absence. With Metro struggling to keep basic Metro Bus and MetroLink service up and running, it is likely that this will not take place anytime soon. Farther east, in the tunnel under Kingashighway and the WU-BJC Medical Center, another Arts in Transit installation appears to still exist, but has not functioned in quite some time. 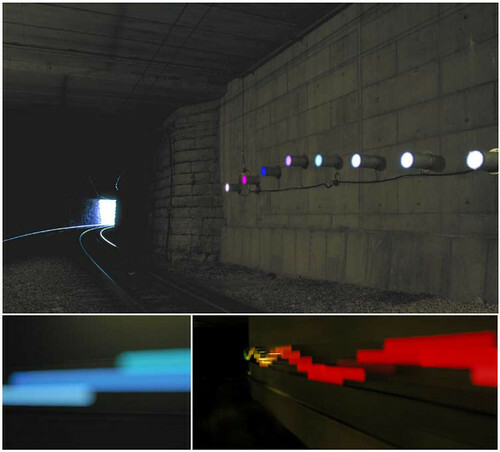 The work by artist Olafur Eliasson installed in 2000 consisted of 60 tubes, containing different colored lights ranging across the color spectrum, mounted to the tunnel wall in a pattern of gentle horizontal waves. Unfortunately, the lights have been out on the work for at least a year. Arts in Transit's web site says that the work was made possible "through the generous support of BJC Health Systems and the special coordination of the St. Louis Art Museum". I find it interesting that work is coming to completion on the new $235 million (just $15m short of a $1/4 billion) BJC institute of Health at Washington University directly over the MetroLink tunnel just east of Eliasson's work and yet nothing seems to be done to fix what is probably a simple electrical problem to make the art work function again. 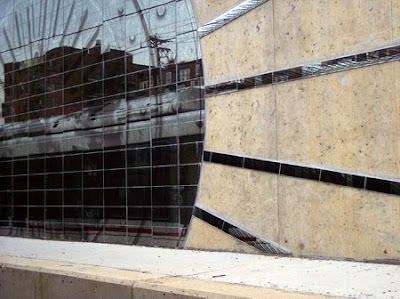 Once again as seems typical here in St. Louis public art takes a back seat. 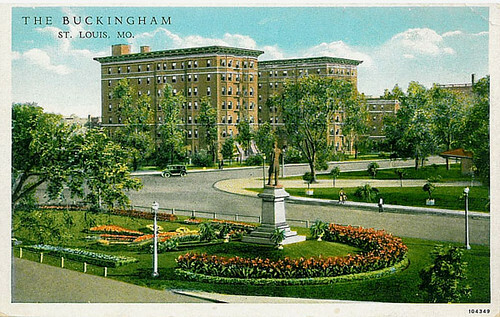 Jeff Vines of STL Style just sent me this great image of a match book cover from the Hotel Kingsway, which was formerly known as the Buckingham Hotel at Kingshighway and West Pine. The matchbook cover was on ebay. Jeff by the way also made an awesome model of the San Luis which he brought to last night's Anti-Wrecking Ball. Here are some photos by Toby Weiss of Jeff's model and scenes from the excellent show. Many thanks to Off Broadway, for donating the space and to The Red-Headed Strangers, Rough Shop, Grace Basement (who came through on short notice), Greta Garter and Elle Adorabelle for their fantastic performances! beginning to open up, revealing the backs of buildings on Maryland beyond. 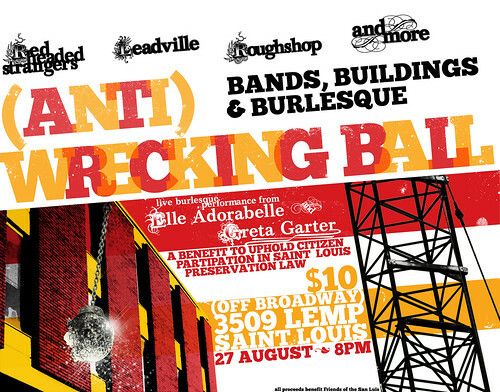 Don't forget that this Thursday night is the Anti-Wrecking Ball at Off Broadway. For details see today's post by Toby Weiss at B.E.L.T. 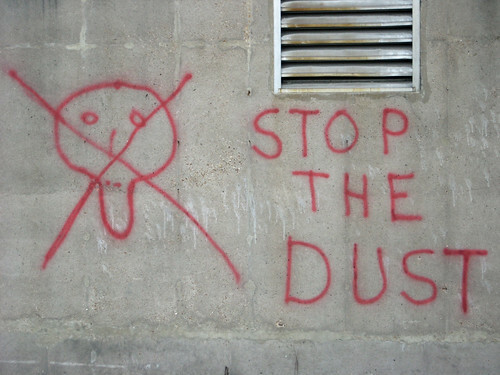 Tell the Catholic Church to stop the dust CALL 792.7002"
A view of the Ettrick Building enjoyed with a group of friends Friday evening from the sidewalk tables at Tom's Bar & Grill on Euclid just north of Forest Park Boulevard. Our server told us that Tom's had been notified that demolition would begin next week. The scale and character of the Ettrick contrasted with the scale and character very similar to that which will replace the Ettrick: the Center for Advanced Medicine across Forest Park Boulevard. This Friday evening take a short drive across the PSB for a happy hour to benefit the The Building Arts Foundation and the Chatillion-DeMenil House Foundation. The happy hour which will run from 5:30 to 8:00 p.m. will be held at the Building Arts Foundation Conservatory, which is home to the nation's largest architectural artifacts collection. 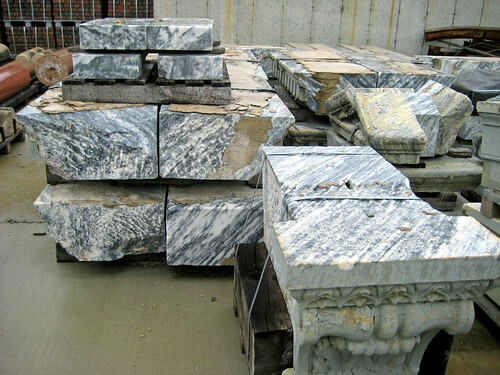 On display in the Conservatory's yard and former foundry buildings are relics salvaged from the Century Building and a long list of other St. Louis landmarks that have been demolished over the years. Scroll down for more information and a map to get there. Please come Friday to support two great causes. The Building Arts Foundation is raising money for ongoing conservation of the artifacts and it's large library collection and the Chatillion-DeMenil House Foundation is raising money for much needed restoration projects at the DeMenil House. 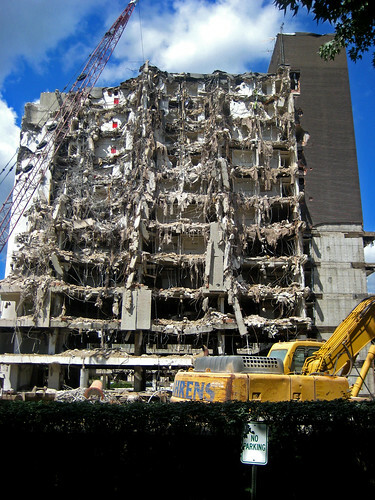 In June I did a post about the demolition of the Buckingham Hotel, later known as the Ambassador. 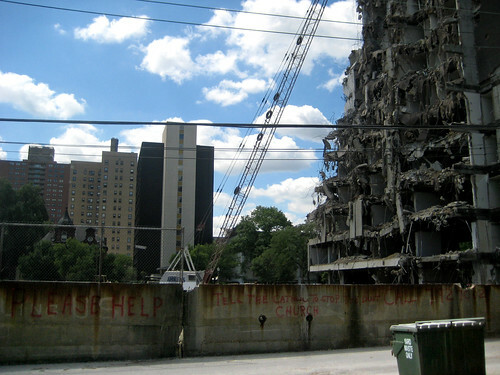 Since its demolition in 1973 the site, which fronts on Forest Park alongside a distinguished row of hi-rises, has remained a surface parking lot. Lindsey Derrington who provided me with some photos for the original post has dug up some great old postcards of the Buckingham from the collection of Landmarks Association. There was brief hope once in 1986 that this lot along with the perpetually vacant Koplar Properties lot that a large development would bring proper definition to this important corner of the Central West End. 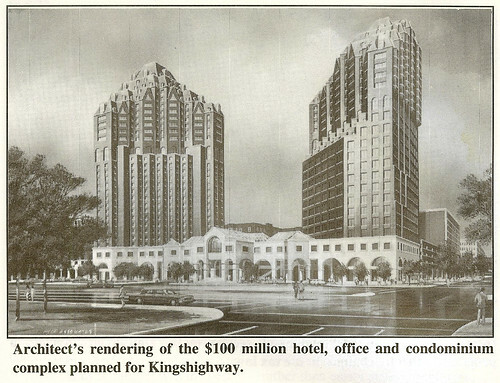 A rendering was produced and published in the West End Word showing twin 30 story towers rising from a low-rise building base occupying the full extent of both properties. 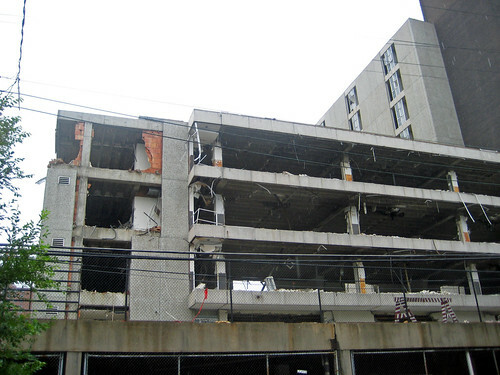 The development would have contained a hotel, offices, a cinema, retail and condominiums. 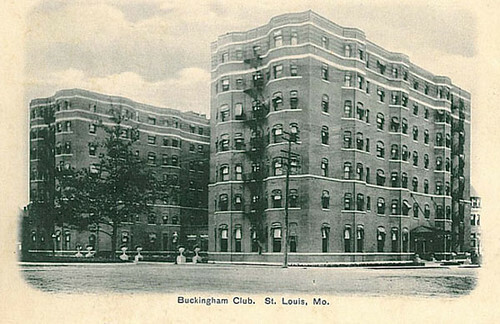 While the architecture was typical 1980s, post-modern including some really bad mansard treatments at the top of the towers, the buildings would have brought a sense of completion to the stretch of Kingshighway along the east edge of Forest Park. Like many tower proposals over the years, this one went no where and this prime Forest Park frontage remains parking lots today. Soon the Central West End will have yet another blank parking lot at the corner of Lindell & Taylor complements of the Archdiocese of St. Louis. Only time will tell if this space sits empty for 36 years or more. On Thursday August 27th the Friends of the San Luis will be hosting the Anti-Wrecking Ball a benefit show at Off Broadway. 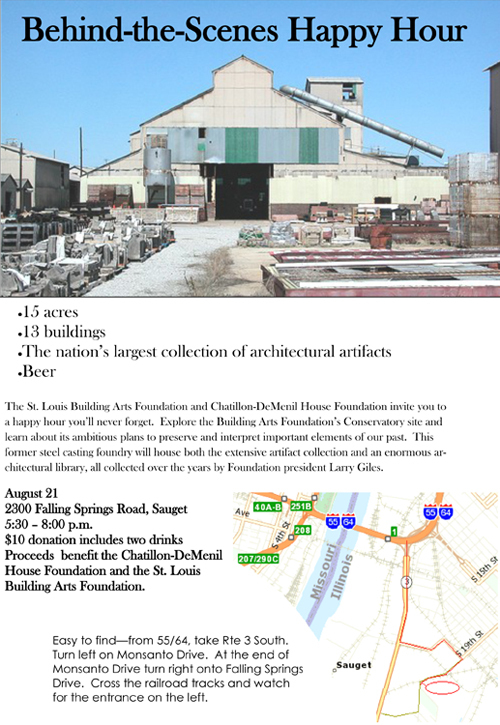 Proceeds from the show will go towards continuing the legal proceedings to clarify the right of citizens to appeal decisions of the St. Louis Preservation Board. The San Luis may be lost, but the right to appeal must still be resolved. For more details about our appeal see: noparkinglotonlindell.com. Mark your calendars and come to the show. Please note the new time: 8:00 PM... doors open at 7:30. Unable to attend the show? The Friends of the San Luis are now accepting donation through PayPal. 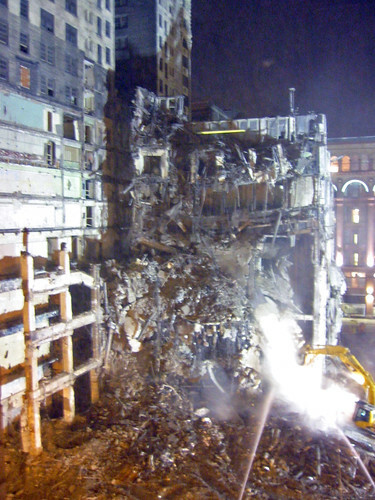 Its been four and a half years since the last of the Century Building came crashing down with a shock wave that shook the surrounding block blocks in early February 2005. 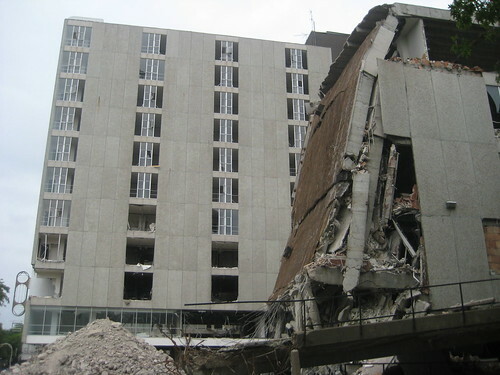 Yet after this much time, Desco, the City of St. Louis, and the State of Missouri are still pushing forward their vendetta with a lawsuit against those who dared challenge the Century's demolition. This coming Wednesday, August 12th, Revitalize St. Louis will be hosting a fundraiser at The Royale for the legal defense fund of Marcia Behrendt and Roger Plackemeier. Please come support Marcia and Roger or consider mailing a donation if you cannot attend. 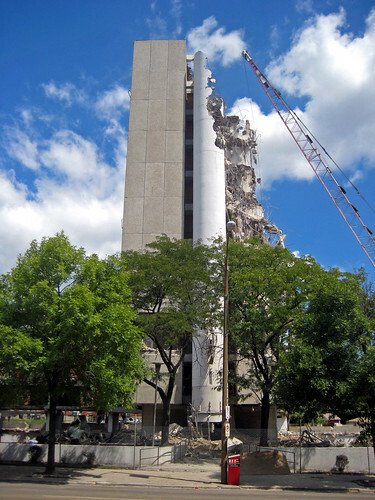 The Century Building may be gone, but not forgotten! 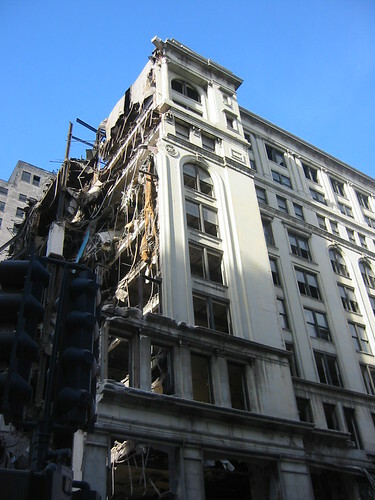 Preservationists Marcia Behrendt and Roger Plackemeier are defendants in a SLAPP suit from the City of St. Louis and the State of Missouri over the demolition of this historic landmark. 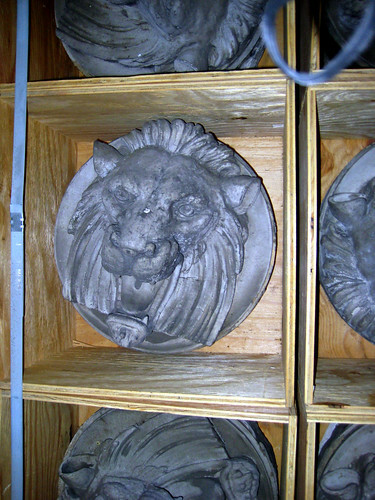 You can aid their defense and show a support for St. Louis’ architectural treasures. Dave Drebes Players will be the featured entertainment. Complimentary appetizers will be provided by the Royale. Suggested donation of $5 at the door. This malicious prosecution has continued for over four years and the trial is set for September 14, 2009. 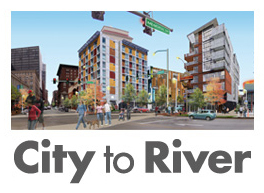 Marcia and Roger took a stand for their neighborhood – downtown – and all who love our City’s architectural heritage. The lawsuit against them is a classic SLAPP suit - a strategic lawsuit against public participation. Presumably the city and state, through agencies, have unlimited funds to pursue these two individuals for years. This is where you can help! Marcia and Roger need assistance with their legal costs. Your donation will help. Please come and support Marcia and Roger and learn more about the status of the litigation and what you can do to help. While on the subject of being slapped in the face, this Tuesday,August 11th, Desco's Culinaria market is scheduled to open on the first floor of the Garage Mahol. 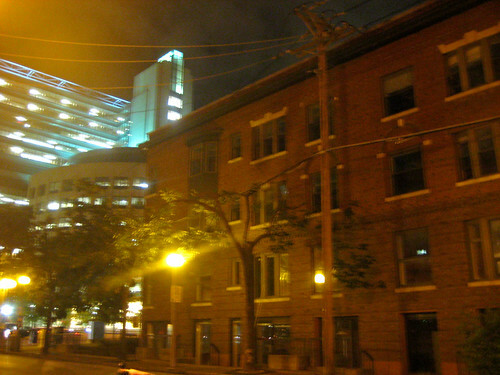 The announcement of the long rumored store opening (February 2008) came after Craig Heller had already announced plans to expand City Grocers (November 2006) into the large first floor space in the Syndicate Trust Building, across the street from their current location and directly backing up to the Culinaria. After Schnucks finally made their announcement, City Grocers dropped its plan to expand, and will instead re-invent itself as City Gourmet, which will focus on expanded deli and prepared foods, wines, specialty products, and less on traditional grocery items. 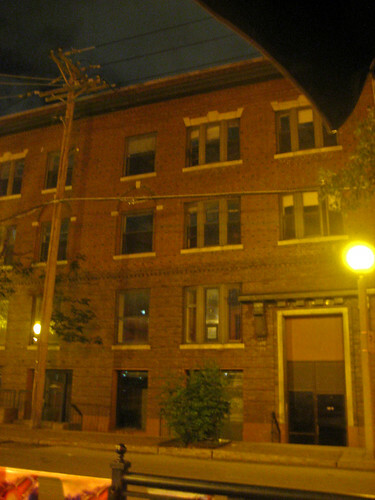 The first floor of the Syndicate is still available for lease. By the way, the Culinaria received a whopping $4.14 million subsidy from the City, State of Missouri, and Federal New Markets tax credits. That comes to a nearly $200 per square foot interior build-out allowance for the 20,800 s.f. 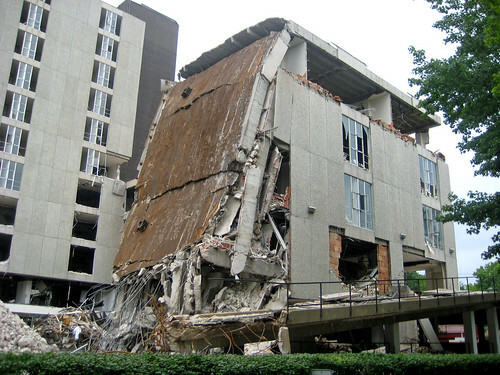 space, which is more than a complete out of ground building costs to construct. While I a glad that a full service grocery is finally opening Downtown, and agree that this will be great for Downtown in the long run, it is sad that it came about through such a convoluted chain of events. Like many urbanists and preservationists I know, I will be staying out of the Culinaria unless absolutely necessary. It would have been nice if Schnucks had not abandoned Downtown in the first place when they closed their store at 7th & Olive in the 1980's. 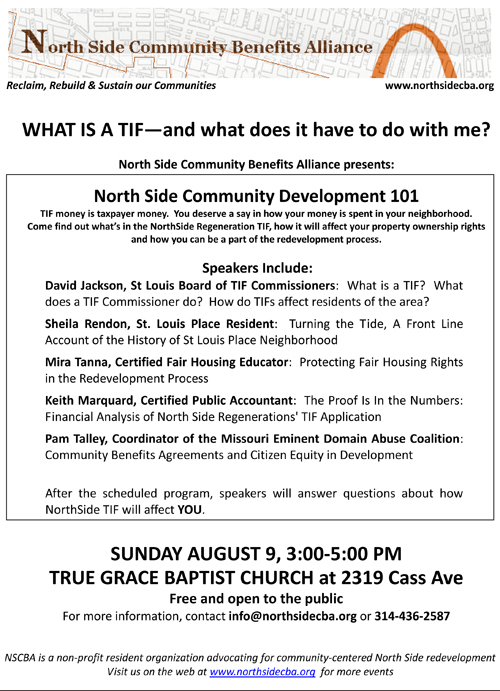 This Sunday, August 9th, the North Side Community Benefits Alliance is presenting information about the proposed $409 Million North Side TIF that Paul McKee plans to push through City Hall this fall. The seminar will be held at True Grace Baptist Church at 2319 Cass Avenue. 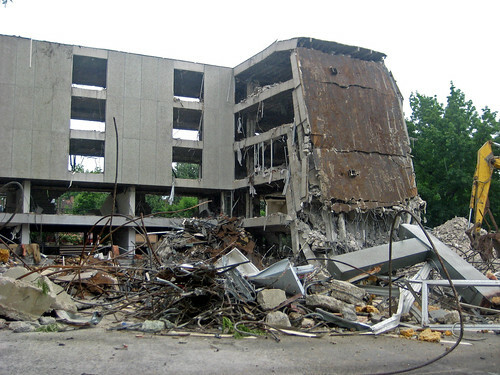 The roof of the former DeVille Motor Hotel drapes over the truncated stump of the east wing of the E-shaped building. 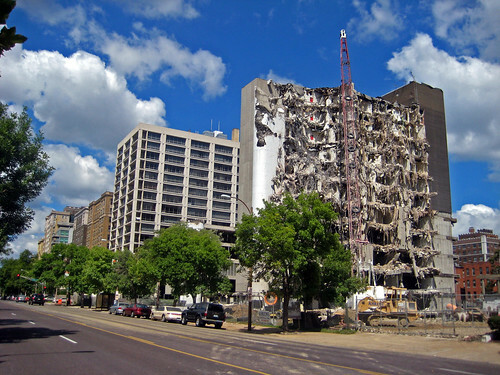 View from Lindell Boulevard of the demolished east wing and the growing piles of rubble. An eerie unobstructed view of the central wing of the DeVille is now opened by the removal of the east wing. 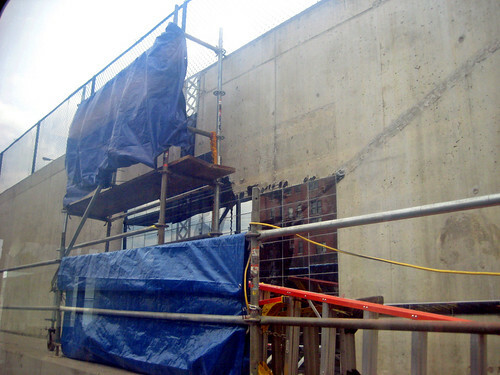 The once entirely glass faced north elevation is stripped down to the bare concrete structure.